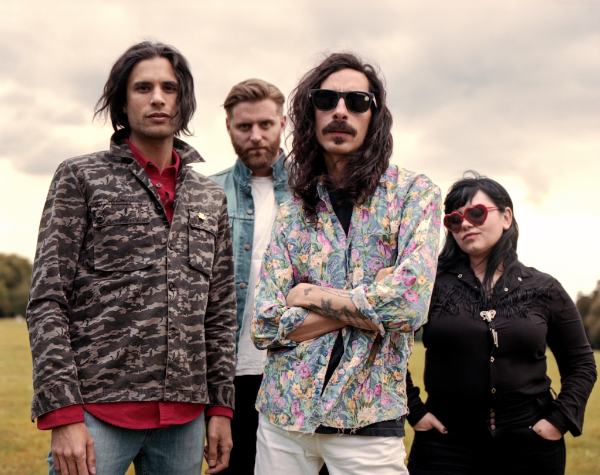 Bristol-based alt-rock mavericks Turbowolf have released ‘Domino’, the latest single taken from their upcoming album ‘The Free Life’, which will be released via So Recordings on March 9th. ‘Domino’ is a transportative, transcendental voyage into the anarchic punk ethos of Turbowolf. A breakneck sonic journey of driving bass lines, immersive overdrive and cutting synthesisers, the track races through pounding verses before exploding into its anthemic chorus. Refusing to conform, ‘Domino’ weaves between swirling psychedelia, explosive peaks of fuzz-laden chaos, and subtle breakdowns. Throughout, Mike Kerr of Royal Blood trades vocals with Turbowolf lead singer Chris Georgiadis amid the track’s loose-wire aural pyrotechnics. Turbowolf have just been announced as the main headliner for Royal Blood’s upcoming US tour. Produced by the band themselves and mixed by longtime associate Tom Dalgety – “Our spiritual guide, our God,” says Andy – The Free Life harnesses the insanity crackling through the air right now, distilling it into a set of songs that veer gloriously between the anthemic and the gritty, the psychedelic and the pop, the unhinged and the profound. JUSTIN TIMBERLAKE BRINGS THE MAN OF THE WOODS TOUR TO AMWAY CENTER ON MAY 14 // TICKETS ON SALE MON, JAN 29 AT 10 A.M.